Our stay was very nice. The beds are extremely comfortable and the shower heads are great. The location is wonderful everything is within walking distance. The best part were the Proprietors of this motel. The Proprietors were quite accommodating. We were in a bind so they let us leave our luggage in our room after check out in order to kill time for our flight. I highly recommend this establishment. 5 stars. PS it’s on the beach. Clean, clean, clean! Owner is outstanding and accommodating. Step back in time to this great motel and enjoy. We stayed in the two bedroom unit with private balcony and view of the gulf. These folks know what they’re doing. They even have beach towels to use incase you forgot yours. We will be back. This is a small older place, but was extremely clean and comfortable. The couple that owns it do a great job of providing for your every need. About a mile from the main shopping and dining area, but easy to get to or going to the harbor at the other end was simple. 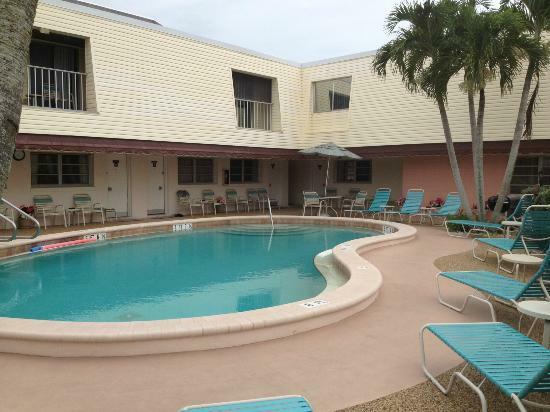 There is a short walk to the beach or a pool right outside your door. I would definitely stay again. Only nitpick is having to go outside the room for coffee but found out you can get a room coffeepot on request. Chosen at random. Walked in without a reservation on Friday, Nov 29, and they had one room left. It was #14, an efficiency unit with two beds. Wow, we were lucky! Private patio, comfortable beds, well equipped kitchen, very clean, assigned parking, comfortably heated pool, VERY short walk to the beach without crossing the street, beach towels available, and beach chairs provided. Previous guests had even left floats and Styrofoam coolers behind. All for $109 per night. free parking. Couldn’t have been better, just wish we had had more time to stay here on our recent trip to Florida. This is an older “motel” but in excellent shape, newly refurbished, very clean (spotless, no sand on the carpet despite being right on the beach and on the ground floor), market right across the street, flat screen TV, fridge, microwave, lots of towels and pillows, WiFi good, etc. can’t complain about anything and an excellent price point (important as I am carrying 2 hotel rooms on this stay, Orlando and anywhere else we travel to). King size bed was great. Owner asked if we wanted a coffee machine and she brought it in right away. Very friendly owner, had a nice chat about the economy.